360 Degree Feedback – CORE Consulting Inc.
Research confirms that leadership skills positively influence sales, net income, turnover and employee engagement. So how can you ensure that your leaders have the competencies and skills they need to drive results? 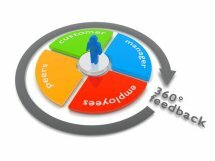 By implementing a 360-degree feedback process for all your leaders. 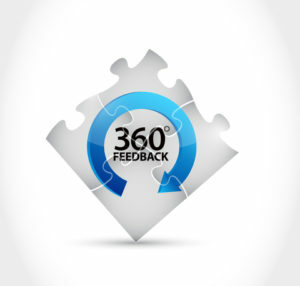 For almost 20 years, our firm has been designing and implementing 360-degree feedback tools for a diverse group of clients throughout North America. We’ve discovered that despite the popularity of 360s, there are three myths. Myth #1: One size fits all. Organizations are unique in terms of strategy, direction and competency models. 360 tools need to be customized to reflect these and uncover the challenges or roadblocks. Is change leadership important, given shifts in the market place and your new priorities? Do you want to improve employee engagement, through improved coaching and mentoring? Or is your goal to break down silos through enhanced collaboration and teamwork? Myth #2: We won’t get great response rates. Our clients have achieved anywhere from an 85-99% percent rate from the C-Suite to individual contributors. The key to high participation rates is to ensure that leaders understand the why, what, how and when. Communicate the reasons to have 360s in an interactive group session, so that questions and concerns can be voiced. Emphasize confidentiality and anonymity. Communicate your commitment throughout the entire process. Myth #3: A 30-minute debrief is enough to create behavioural change. Absolutely not! Leaders require an opportunity to read and reread their report on their own, with guidelines. Then they need a 1-2 hour debrief with an experienced, skilled coach followed by at least one coaching session to create a leadership development plan. The plan should define goals, activities, resources and timelines and be supported by the individual’s leader. If you would like to discuss a 360-degree tool for your organization, please contact us at (905) 990-2515 or email jhill@coreconsultinginc.ca. We look after every detail in the entire process, from customizing the web-based 360-degree survey, to administering the survey, to responding to questions and to compiling a detailed report for the leader and coach. Our team of highly experienced, skilled coaches will conduct insightful coaching debriefs with your leaders and collaborate with them to develop impactful leadership development plans. Is Your Feedback a Gift Card? We often use the expression “All feedback is a gift.” During this holiday season it occurred to me that in fact, feedback is a gift card. A recent study estimated that if you don’t use a gift card within two weeks of receipt, there’s only a 20% chance that you will ever use it. Some cards even have an expiry date. So are you in the two week “zone”? Or is the feedback you received still sitting in a drawer somewhere? Most of us are engaged in setting goals, especially at this time of year. So how can you use feedback you’ve received and ensure it is reflected in your personal learning plans for 2011? 1. Review all your feedback. Consider what you’ve received in the last 3-6 months, including 360s, internal and external surveys, coaching from your boss and any informal feedback. Determine the themes and patterns. What is your feedback saying about how you need to grow? 2. Determine what resonates with you. If you’ve had the same feedback three times, it is time to pay attention. For feedback that you don’t agree with, do some fact-finding. Make sure that gift card isn’t counterfeit. 3. Establish your learning goals. Decide what you want to learn, how you’ll get there, when you’ll know you’ve been successful and your timing. Write this down and post it in a visible spot. Let your boss and others know so they can give you kudos for your progress. 5. Keep your eye on your gift card’s balance. Take advantage of all the feedback you’ve been given. Try to spend it all. Make sure you use your entire gift card. In 6 months when you review your personal learning plans, you’ll have an amazing sense of accomplishment. All feedback is a gift! Many of you commented that my blog “Prepping for Performance Reviews – 7 Derailers” will help make your performance reviews more constructive. You asked: How do you give difficult feedback so it’s actionable? What if your employees don’t accept your input? How can you help them not be defensive or emotional? We recommend being coach-like. Don’t tell your employees what to think, e.g. “You need to improve your interpersonal skills.” Ask questions. What about this feedback resonates with you? What surprises you or puzzles you? Why do you think you are getting this input? How do you want to address it? In our experience when employees absorb difficult feedback, they understand it better and are more motivated to act on it. Our recent survey of HR professionals reveals that persuading leaders to implement 360° evaluations can be challenging. Why the pushback? Leaders cite negative repercussions for respondents, defensiveness/anger about feedback and time involved. All of these can be addressed effectively in how the survey is designed, communicated and administered. If your role involves building the case for 360s, job #1 is to communicate the “why”: the benefits of engaging in this process. We need to understand how our behaviours affect others. 360s provide a solid basis for establishing our leadership development plans. Using key organizational competencies ensures that development plans are aligned with our organization’s strategy and direction. Feedback improves motivation and results. CORE offers both electronic and interview-based 360° evaluations as well as professional coaching to leverage the results. Contact us for a sample report and for a cost-effective quotation.